How we create second chances in your community? First, we will employ, train, and empower individuals being released from the judicial system through the trade of carpentry. We buy distressed properties in areas that have been hit the hardest by the financial and violence crisis. We renovate these properties so they serve a positive purpose in their communities. This stops them from being eyesores on their blocks and starts to raise property values in these communities. Demolishing these properties does not help the problem, as it only draws interest away from potential investors, and deters families trying to buy a home or building in these communities because the area has more vacant lots than standing structures. Second, we believe it's extremely important to start curbing the violence in our city streets by creating Employment Opportunities for ex-offenders with little to no employable skills. Their criminal backgrounds make them a liability for most employers. 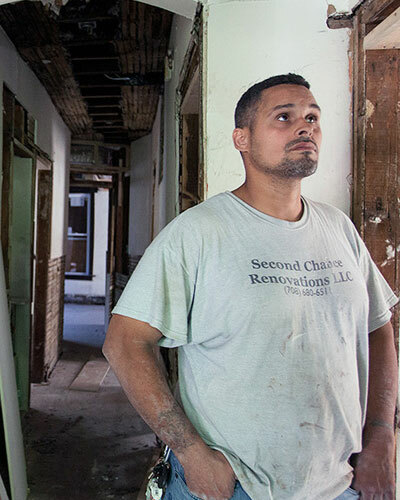 Second Chance Renovations puts these men to work and pays them an honest day's wage. We give these men meaningful employment and allow them to redeem the very communities that we have taken from. If we can employ these men and help them legally and meaningfully provide for their families, it will have a considerable impact in reversing the trend of violence and recidivism on our city streets. It will show these men that not everyone thinks they are a lost cause and will give them something to look forward to. We know that we will not be able to help everyone. The truth of the matter is, not everyone is ready to change. For those who are, this opportunity can be life-changing. We work alongside an organization called, U-turn Permitted, run by the North Lawndale Employment Network. This organization re-trains these men on how to re-enter society and the workforce. The percentages for Recidivism among the men who go through the U-Turn program is 4% compared to the National average of over 27%. Recidivism is not a problem that is Exclusive to one particular area, although it is more prominent in some areas than others. It is a citywide problem that MUST be addressed. Second Chance Renovations also partners with an organization called Front Line Street Intervention of Round Lake Beach, IL. This program will allow employees to remove any gang-related tattoos at a drastically discounted rate. This allows ex-gang members to distance themselves even further from their previous lives while working towards success. People are dying and the futures of so many of our young people are being dramatically changed by the violence in our communities. There is simply not enough being done to stop it! The police cannot do it themselves. We need to build strong leaders in our communities. The men employed by Second Chance Renovations will be mentored and Ministered to, so they can bring that missing leadership and hope back to their communities. Together we can get these Communities and those individuals who want a SECOND CHANCE get one, and become part of the solution as opposed to compounding the PROBLEM. Please join our cause today! Restore vacant and distressed properties in Underserved Communities so they can thrive again.